This month in our town it has been all about emergency preparedness. With so much going on in the world, and disasters happening all over the place, even very close to home, we have been feeling a sense of urgency to work on our food storage. We were also counseled a couple of weeks ago to live within our means. For me this meant that I needed to work on my budget. The place we spend the most money is our food and unfortunately, even though I cook a lot, most of it takes place on the weekend. During the week we are so guilty of eating out. We eat out A-LOT!!!! I mean a ridiculous amount. So my sisters and I decided we would use recipes we already have, things we know our families love, and spend an afternoon making freezer meals. They are just nice to have on hand for all sorts of things. Meals on the fly for when we are in a rush, or sick, or just don't feel like cooking. We chose 5 of our favorite dinners, 2 kinds of cookies, and 2 breakfast items. We went shopping and kept the receipts because we wanted to be as accurate and we can be for those of your wanting to try it. We also opted for the throw away pans, press n seal, heavy duty tin foil, and gallon size zip lock freezer bags for storage. Before all the madness began, we stacked all of our groceries on the table. We looked over our recipes and decided that one of us would start cooking our meats on the stove, while the other mixed her batch of cookies. We had our sister Mary, and my daughters there helping us assemble things as we went along. Mary and Paige cooked the french toast sticks, while MaKady scooped the chocolate chip cookies onto the cookie sheets to be frozen. Meanwhile Tabitha put together the Shepherds Pie. After my batch of cookies I got my chicken enchiladas put together. We covered our pans with press n seal, then covered that with tin foil to help avoid freezer burn. We both shared the table so I could put together the lasagna and Tabitha scooped the chili into gallon size freezer bags. 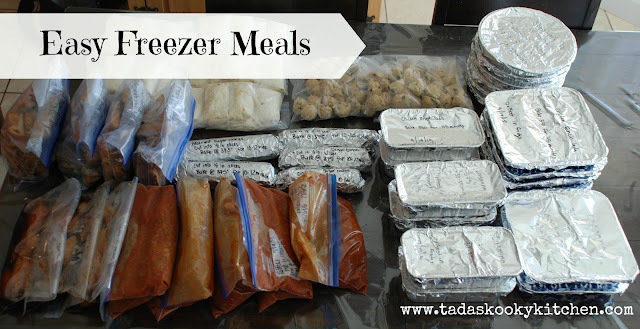 We used freezer bags for things that don't need to bake in the oven in it's own container, like chili that will cook in a crock pot or on the stove, and Samoan chicken, which will get cooked on the grill. Next Tabitha made sugar cookies while I put together some breakfast burritos. In total, we have 328 servings of food. Our groceries cost $150 for everything, with the exception of a few spices and flour that we already had on hand). Each serving cost $0.46. You guys!!!! Seriously. Compare that to what you would spend getting a pizza, which is about $1.00 per serving, or eating at McDonald's which is about $5.00 per serving. You can see that a little bit of time is so worth it. 2. Select meals that you know your family will eat. It doesn't do anyone any good picking meals if your family won't eat them. 3. Label your meals. Write what it is, cooking instructions, and the date it was made. Now our freezers are full and we don't have to worry about spending money eating out. Woohoo!! !